LOS ANGELES— Approximately 1,400 attended the second outing of the Hollywood Symphony Orchestra Saturday night, Oct. 7, on the Westwood campus of UCLA. Many patrons, filing out of Royce Hall after the two-and-a-half-hour concert, said they felt it was among the finest presentations of film music they had attended in the L.A. area in recent years. The choice of material – a wide-ranging potpourri of classic and modern music – plus the high level of performance and an interesting turnout of celebrity "presenters," were cited. John Scott again conducted the 75-piece orchestra and, during the second half, a 54-voice choir (the Cantori Domino augmented by an ensemble called the Greater L.A. Area Massed Choir, Maurita Phillips-Thornburgh, director). The concert featured two world premieres from films that will be vying for honors at Oscar time: Craig Armstrong's "cello theme" from his score for World Trade Center, a poignant, three-minute piece that served as an elegy for the 2,700-plus dead in the 9/11 attacks; and a five-minute suite – partly lyrical piano miniature, partly military-style war music – by Clint Eastwood, orchestrated by Lennie Niehaus, from his upcoming Flags of Our Fathers. World Trade Center producers Michael Shamberg and Stacey Sher introduced the music from their film, while actor Charles Durning – who, surprisingly, was among the first American soldiers on Omaha Beach during World War II – introduced the Eastwood piece. Andrew Shulman was the cello soloist. Also receiving its U.S. premiere was an eight-minute suite from Don Davis' complex, postmodern music for The Matrix (1999), first film in the trilogy. Actress Gina Torres, who appeared in the second and third films, introduced the work. 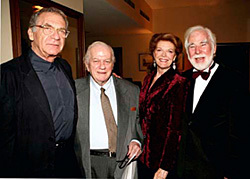 Scott – introduced by actress Samantha Eggar (who appeared in the HSO's debut concert in May) – opened the concert with an exciting performance of the overture from Maurice Jarre's Oscar-winning score for Lawrence of Arabia (1962). He followed this with a new arrangement of Elmer Bernstein's classic jazz theme for The Man With the Golden Arm (1956). This was, perhaps, the concert's weak point, as the new more polished arrangement lacked the raw intensity of Bernstein's original. Director Sydney Pollack introduced "Se Fue" from Dave Grusin's Oscar-nominated score for Havana (1990). Adding the right music to a rough cut of his film, he said, was "like I'm seeing it for the very first time, like a fuzzy picture that jumps into focus." Also in the first half, Scott conducted a new arrangement of Ernest Gold's Oscar-winning theme from Exodus (1960) and a five-minute suite from his own memorable score for the 1980 science-fiction movie The Final Countdown. Act two featured another new piece that combined the opening theme and the classic song "Green Leaves of Summer" from Dimitri Tiomkin's score for The Alamo (1960). High points for the concert, performance-wise, were "Love Scene" from Miklos Rozsa's 1961 score for El Cid – perhaps one of the greatest love themes ever written for the cinema, sounding rapturous in the superb acoustics of Royce Hall – and John Williams' rarely heard "Main Title and Storm" from his darkly powerful 1979 score for Dracula. Director John Badham introduced the latter. Scott finished the concert with a 13-minute condensation of the key musical moments from Sergei Prokofiev's landmark score for the 1938 Soviet film Alexander Nevsky, including the opening, the well-known "Battle on the Ice" and the finale. It had the crowd on its feet. The concert was videotaped for possible future telecast, and once again there was a lavish color program that featured discussions of the music and bios of all the composers. Large video screens on both sides of the stage offered occasional still images from the films but were mostly devoted to well-timed shots of the musicians themselves. The HSO is clearly on the right track and, with the right level of support (both corporate and audience), could become a regular and welcome home for the performance of both classic and current film music in the Los Angeles area.